Freeware tool that automatically reminds users to change their passwords before they expire so you can ensure IT security and reduce helpdesk workload. "We no longer have users calling the helpdesk about expired network passwords. 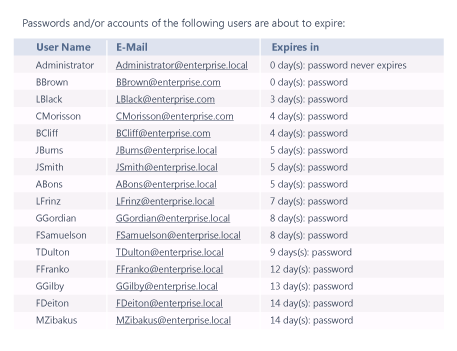 Netwrix Password Expiration Notifier has worked very well for our company." Sends timely email alerts to remind users to change their passwords in Active Directory before the password expiration dates. Automatically delivers summary reports on user account passwords that are about to expire right into your mailbox. Facilitates strong password policies to harden the security of your IT environment and ensure compliance. Reduces the time spent on password-related support tickets so you can focus on more important tasks. Proactively resolves password expiration issues to maximize user productivity and service uptime. Doesn’t expire, so there’s no need to bother with licensing extensions or worry that it will suddenly stop working. 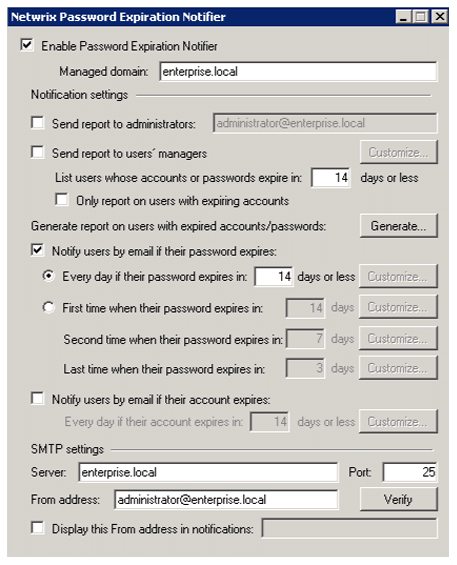 Setting a Group Policy that regulates the user password expiration period is a basic best practice for securing Active Directory. However, many users, especially remote users, either don’t get the default Windows pop-up messages that warn them about upcoming password expirations, or simply ignore them. As a result, they fail to change their passwords on time, and your help desk team has to constantly hustle to keep everyone productive. Netwrix Password Expiration Notifier won’t leave your helpdesk admins buried in password-related tickets, so you can maintain a strong Password Expiration Group Policy. The free tool automatically sends users an email alert that specifies the number of days left before password expiration, and also notifies you about when each user account ‘s password and which user accounts will expire. Netwrix Password Expiration Notifier is free and never expires. However, the tool has limited functionality. For full functionality, try Netwrix Auditor for Active Directory, which can be evaluated for free and without any limitations for 20 days. "Since implementing the Password Expiration Notifier, our helpdesk has seen trouble tickets relating to passwords completely disappear. This product has been a lifesaver, not only to our IT staff, but to our remote users, by practically eliminating downtime."